Where does all the dirt go?” The answer lies in the advancement of the polymer-based cleaning formulations used in encapsulation. This chemistry provides clean carpet that resists re-soiling and wicking of stains, keeping carpets cleaner for a longer period of time by coating the fiber with anti-re-soiling polymers. Systems that use fast drying technologies while also limiting volatile organic compounds (VOCs) and residues left behind after cleaning are of primary interest for home owners and professionals looking to deliver cleaning that not only improves the visual appeal of the space but also has health benefits. Encapsulation cleaning is a true minimum-moisture method that crystallizes oils and soils. Carpet-cleaning technologies employed today constantly strive to clean carpet better and leave the fiber not only visually clean, but in a healthy condition after cleaning. 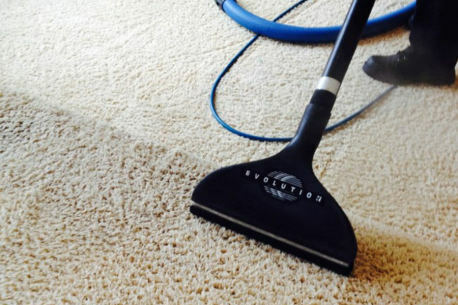 Pre-vacuuming carpet with a pile lifter or commercial-grade, high-performance vacuuming system is essential before and after the encapsulation process in order to leave the carpet as clean and healthy as possible. Similar to carpet protectors, encapsulation cleaning leaves the fiber in a state where oils and soils have a more difficult time attaching to the carpet fibers. Therefore, the majority of soil will be vacuumed away much easier during routine vacuuming after the use of encapsulation cleaning. Most encapsulation machines use either a rotary brush or a counter-rotating cylindrical system because agitation and the function of the polymer-based chemistry are the keys to crystallizing the soil for easy removal. Encapsulation machines have a solution tank with a shower feed device that dispenses solution into a rotary or cylindrical brush that agitates solution into the carpet. Be Dry In a Few Short Hours. The polymer solution dissolves, suspends and emulsifies the soil. The polymers will dry brittle with the soil and oils surrounded and ready to be vacuumed away within 20 to 60 minutes after the application and proper agitation of the cleaning solution.Encapsulation cleaning is a true minimum-moisture method, an excellent interior maintenance system. For carpets that exhibit severe soil-load conditions, hot-water extraction is essential to use in combination with low-moisture maintenance systems.Low-moisture carpet cleaning systems limit VOCs because of this fast dry time. Encapsulation chemistry minimizes re-soiling, creating a healthier indoor environment, especially when complemented with periodic hot-water extraction cleaning. The Brush Pro System is perfect for commercial applications. 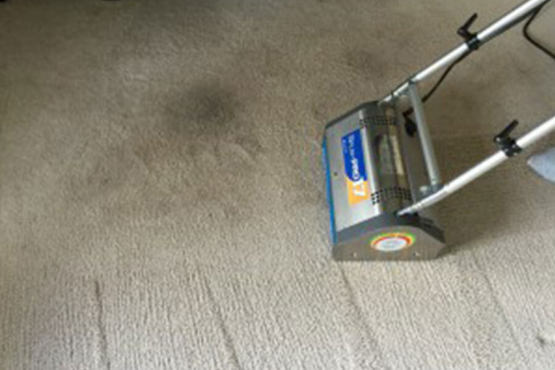 After vacuuming, lightly apply the encapsulation solution with a slightly heavier application for spots and stains. Agitate the soiled carpet with the Brush Pro, spending a little more time on spots, stains, and heavily soiled areas. Allow to dry, and you will be amazed at the results. Additionally, the carpet will appear to get cleaner with subsequent vacuuming.